Dr. Rumore is clinical manager, drug information at New York Presbyterian Hospital, New York, New York. Nothing herein is meant to construe legal advice. The opinions expressed do not necessarily reflect those of the author’s employer. Twenty-five years ago, Congress enacted the Drug Price Competition and Patent Term Restoration Act, commonly known as the Hatch-Waxman Act1 (hereinafter “Hatch- Waxman”)—the cornerstone for competition between brand and generic pharmaceutical companies. Hatch-Waxman amended the Federal Food, Drug and Cosmetic Act (FDCA)2 and the Patent Act3 and achieved a sensitive balance between patent protection and encouraging generic entry. Hatch-Waxman established the abbreviated new drug application (ANDA) process that requires generic manufacturers to demonstrate that the generic is “bioequivalent” to an approved brand drug. Additionally, the generic manufacturer must file a certification regarding patents listed in the Orange Book (also known as Approved Drug Products with Therapeutic Equivalence Evaluations). A paragraph IV certification states that the patent is invalid or will not be infringed and begins a process by which that question may be answered by the courts prior to expiration of the patent. Under Hatch-Waxman, FDA approval of an ANDA is automatically stayed for 30 months when a patent owner files a patent infringement lawsuit within 45 days of receiving a paragraph IV notification. During the stay, the FDA is prohibited from approving another ANDA. Additionally, the first ANDA is granted a 180-day exclusivity period, as an incentive whereby the generic company does not have competition from other generic companies and can both establish market share and charge a higher price. 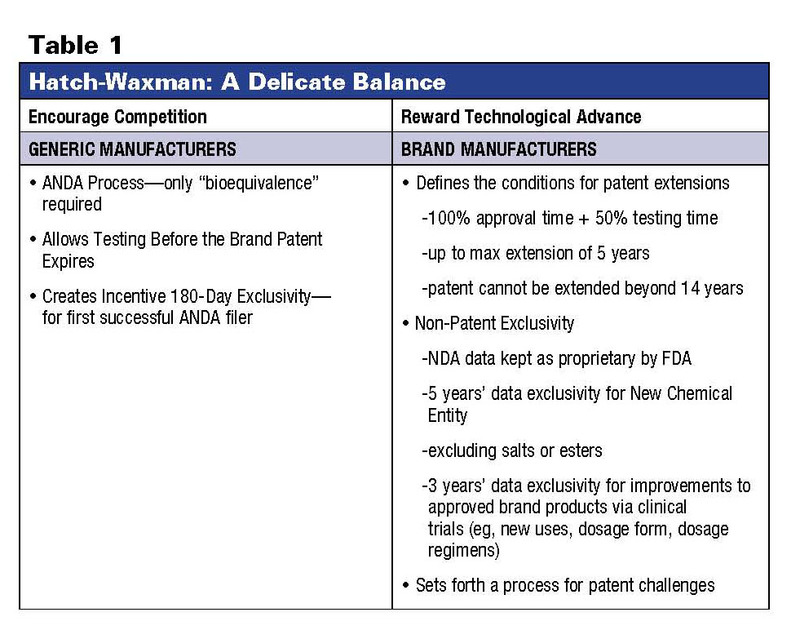 Hatch-Waxman also provided brand companies faced with significantly truncated windows of marketing exclusivity and increasing regulatory requirements for drug approval with exclusivities and patent term restoration and established the maximum length and number of exclusivities that can be justified. Major provisions of Hatch-Waxman are found in Table 1. Although the net effect of Hatch-Waxman on pharmaceutical innovation is ambiguous, its effect on generic drug development has been explicit, and the effect on consumers has been beneficial. Hatch-Waxman resulted in increased ANDA applications and paragraph IV challenges, especially since 1998. There has also been a high success rate for patent invalidation, particularly formulation and polymorph patents. Since Hatch-Waxman, virtually all top-selling drugs not covered by patent face generic competition; whereas pre–Hatch-Waxman, only 35% had generics available. Similarly, today more than 70% of prescriptions are for generics, whereas pre–Hatch-Waxman generic prescriptions numbered 15%. At present, with rapid generic substitution, driven by tiered copays and formularies by thirdparty payers, the rate of generic penetration is accelerated, with 80% conversion within 6 to 8 weeks.4 In addition to substantial generic penetration, generic prices are approximately 60% or less than brand.5 Under Hatch- Waxman, the average length of patent extension is 3 years. Overall, there have been some reduced returns on new drugs, but product life cycles have not changed significantly. Today, bringing generics to market involves more than copying, and time from initial product selection to market can take between 5 and 7 years, including paragraph IV litigation. An unexpected consequence resulting from Hatch-Waxman, especially over the past 10 years, has been the filing of patent applications by generic companies and increased generic research and development for branded products.6 Although clearly not a goal of Hatch-Waxman, generics innovate, often obtaining “design-around” patents or a more efficient manufacturing process, new formulations, or new forms of the active ingredient. Conversely, although there are more ANDAs filed than ever, there are an increased number of “me-too” ANDAs and ANDAs for products which already have a generic version. Although an ambitious piece of legislation, which has fulfilled its purposes, Hatch-Waxman is by no means a model of legislative clarity.7 For 25 years, Hatch-Waxman has been the subject of considerable litigation and administrative review, as the courts, industry, and the FDA have sought to interpret it in a way that is consistent both with the statutory and legislative intent. Early on, litigation ensued to resolve ambiguity and construe the statutory meaning of terms “active ingredient,” “product,” “previous application,” “court,” ”actual controversy,” and “decision.”8 Despite numerous FDA attempts at clarification, many issues in Hatch-Waxman were and remain the subject of controversy. Although the legislative intent of Hatch-Waxman was to achieve a delicate balance of innovation and competition, strategies by both brand and generic companies evolved resulting in the opposite effect. Soon after enactment, faced with intense litigation over their patents as early as 5 years after market approval, brand companies developed strategies to protect their franchises. Case-by-case petitions were filed for consistent application of the patent restoration periods and extensions of such periods. Rx-to-OTC switches requesting exclusivity for clinical research conducted to ensure safety of such switches increased (eg, Claritin [loratadine]).9 Additionally, loopholes were discovered circumventing Hatch-Waxman and permitting brand companies to delay or actually preclude generic marketing and artificially extend patents. Moreover, generic companies developed their own anticompetitive strategies to level the playing field.10 See Table 2. Hatch-Waxman was amended several times to close these loopholes and/or decrease generic drug approval times.11 See Table 3. Additionally, over the years, the FDA issued many guidance documents clarifying Hatch- Waxman with the goals of reducing generic approval time; improving ANDA application quality to avoid multiple review cycles; avoiding time-consuming legal delays; and closing “loopholes” which delayed competition. Unfortunately, anticompetitive strategies and loopholes continue today and fuel the momentum for further legislative Hatch-Waxman reform. Another strategy involves filing an ANDA even if groundless and having little chance for success. When 2 or more generic companies file an ANDA on the same day or for different doses, nothing in Hatch-Waxman precludes sharing of the 180-day period among several companies. Under Hatch-Waxman, the first ANDA filer, regardless of the outcome of the subsequent patent infringement litigation, is entitled to the 180-day exclusivity. For patents found valid, upon expiration, a new ANDA need not be filed. While the intent was to provide other generic companies from benefiting when they had risked nothing, the actual result is a flood of paragraph IV filings. Marketing an AG during the 180- day exclusivity period violates the first ANDA’s statutorily granted “exclusivity,” ie, the policy and intent of Hatch-Waxman, and may run afoul of the Sherman Act or State Unfair Competition Acts. Moreover, critics of AG argue that packaging and labeling the branded drug as a generic are tantamount to “misbranding.” Since 2008, the FDA has been required to publish a listing of AGs; the listing is intended to assist the Federal Trade Commission (FTC) as it moves ahead with its study of the competitive effects of AG. Unfortunately, the practice of AG has grown, especially since 2003, and repeated legislative attempts to ban AG have failed. 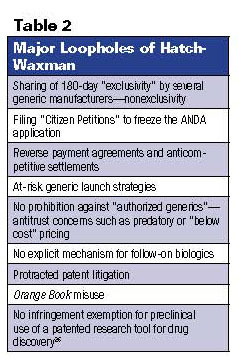 Under Hatch-Waxman, the first ANDA filer, regardless of the outcome of the subsequent patent infringement litigation, is entitled to the 180-day exclusivity. Over the past 25 years, the negotiating power in settlement discussions shifted: generics are faced with the release of an AG even if the generic wins in litigation. Consequently, generic manufacturers must choose to either incur the cost and risk of continuing patent litigation and face fewer returns during the 180-day period, or settle. “Reverse payment” agreements in patent settlements have been the subject of copious litigation with no consensus regarding their legality. Via a “reverse payment agreement” a brand company pays a generic company a substantial amount of money to either not file an ANDA application or stay out of the market for a specified period of time. In some cases, the amount is actually greater than the generic company would actually make if it were to market the generic. While under the MMA the 180-day exclusivity is forfeited for generic applications entering anticompetitive agreements as determined by the FTC or attorney general or failing to enter the market within 75 days of effective approval or 30 months after submission of an application entitling the 180 days, most often the forfeiture is avoided by legal maneuvers and “bottlenecks” continue. Although it would seem that these practices would constitute a violation of antitrust laws, and although the FTC states reverse payments are per se illegal, 2 court rulings in 2005, Schering-Plough v. FTC16 and In re Tamoxifen Citrate Antitrust Litigation,17 where the district courts decided that the agreements did not violate antitrust laws inasmuch as they did not extend the monopoly beyond the scope of the patent, have prompted a resurgence of “reverse payment” settlements. Legislation to prohibit “reverse payment” agreements and “bottleneck” strategies has been unsuccessful several times. HR 1706: Protecting Consumer Access to Generic Drugs Act of 2009,18 introduced in March 2009, would allow the FTC to exempt certain agreements on a case-by-case basis when deemed in furtherance of market competition together with forfeiture of the 180-day exclusivity period under certain circumstances. Branded patents coming off patent are valued at over $10.9 billion in 2009. Hatch-Waxman effectively puts a bounty on brand drug patents. The FDA has no expertise or resources with which to resolve complex questions of patent coverage, and the agency’s role in the patent listing process is merely ministerial. Generic and brand companies may only resolve any patent disputes in private litigation. For years, the Orange Book was a barrier to generic drug availability in contrast to the original intentions of Hatch-Waxman. Patent “evergreening”—that is, obtaining additional patents on specific features of a drug product, eg, isomers, polymorphs, metabolites, intermediates, process patents, or double patenting— became a popular practice among brand companies with expiring Orange Book patents to extend the monopoly on a drug. Multiple 30-month stays were triggered when the NDA holder added new patents to the Orange Book, whereas each patent required a separate paragraph IV certification, thereby resulting in a new lawsuit, and, hence, new 30-month stays. In some cases, companies had chains of patents which were added to the Orange Book in a staggered manner to keep generics out of the market. Under the MMA, generic companies must now only certify to Orange Book patents listed at the time of initial ANDA filing, effectively preventing multiple 30-month stays. Unfortunately, the strategy of label changes, reformulations, and line extensions continues. Prior to Hatch- Waxman, line extensions were rare. Today, variations of existing products such as a new formulation or dosage form are intended to shift market share to the new product protected from price competition, because the variation is granted the market exclusivity that the original is about to lose. A Citizen Petition is a request that anyone can make to the FDA regarding a specific aspect of a pending application. Questioning the quality of a competitor’s product through lastminute Citizen Petitions with dubious or frivolous claims is yet another method to delay generic competition. Additionally, the Citizen Petition results in a “hold” on the ANDA until decided. Although statutorily the FDA commissioner may take up to 90 days to investigate the petition, it often takes much longer. Generic manufacturers would like to prohibit or limit the filing of Citizen Petitions by innovator manufacturers. At present, there is no express mechanism for abbreviated approval similar to Hatch-Waxman procedures for generic biologics or biogenerics (also known as follow-on biologics). In September 2006, the FDA approved omnitrope, a generic version which referenced the brand product Genotropin. Similarly, the FDA approved a slightly different isoform generic version of Pergonal (Repronex) under the ANDA process, deeming the slight variation “not clinically significant.” The FDA explicitly stated that this approval did not create a pathway for all generic biologics, however. Congressional bills to allow for generic biologics were rejected in 2007 and 2008 but are on the legislative agenda for 2009—exclusivity being the difficult parameter to agree upon. HR 1427, the Promoting Innovation and Access to Life-Saving Medicine Act, introduced in March by Rep Henry Waxman of Hatch-Waxman fame, authorizes the FDA to approve abbreviated applications for “biogenerics” and mirrors the market exclusivity provisions for drugs, whereas the biotechnology brand industry is seeking between 14 and 20 years of exclusivity. Additionally, President Obama’s budget proposal includes plans to establish a regulatory pathway for approval of generic biopharmaceuticals. Looking at the issue from the brand manufacturers’ point of view, they argue that disclosure of information presented in an NDA is prohibited and is tantamount to an unconstitutional “taking” of a property interest without compensation or, alternatively, a violation of the Trade Secrets Act.24 Therefore, the question remains whether it would be beneficial to apply generic biologics to the established Hatch-Waxman process. Throughout the years since enactment of Hatch-Waxman, the US patent and regulatory systems continued to evolve. The average drug research and development time is now 10 years, and the total costs often exceed $750 million. At 5 years, the United States currently has the shortest data exclusivity protection for innovative drugs. Listing a product in the Orange Book results in a de facto exclusivity of about 7.5 years. The Hatch-Waxman Act did encourage growth of the generic industry and provided brand companies with incentives. The incentives led to gaming of the system, however. While some maintain that the FTC has adequate authority to challenge litigation settlements that may be anticompetitive, others believe the judicial system is not the appropriate venue to resolve these issues. As we celebrate the 25th anniversary of the signing of the Hatch-Waxman Act, Rep Waxman recently stated that the Hatch-Waxman model “has worked well for 25 years.”25 Most would agree that the Hatch-Waxman wheel does not need to be reinvented via legislation. Clearly, there is a need to perpetuate an “innovation culture,” not a “litigation culture.” Looking back over the 25-year history of the Hatch-Waxman Act, its successes and failures, and looking forward at proposed legislative reforms, it is clear that the pharmaceutical scale must remain balanced. 1. Pub. L. No. 98-417, 98 Stat. 1585 (1984) (codified as amended at 21 U.S.C. §355 and 35 U.S.C. §156, 271 and 282. 2. Food, Drug, Cosmetic Act. Pub. L. No. 75-717, ch. 675, 52 Stat. 1040 (June 25, 1938) (codified as amended at 21 U.S.C. §§ 301-399 (2002). at 21 U.S.C. § 355 (2006). 3. United States Patent Act. 35 U.SC. § 271 (2006). 4. Silver R, A Wall Street Perspective on Generics, 2007 GPhA Meeting, March 1-3, 2007, available at www.gphaonline.org/AM/CM/ContentDisplay.cfm?ContentFileID=593. 5. Saha A, et al. Generic Competition in the US Pharmaceutical Industry. May 2005. 6. Seventh Annual Life Sciences Alley Conference. Minneapolis, MN, Dec. 10, 2008. 7. Eli Lilly v. Medtronic, Inc. 496 U.S. 661, at 649 (1990). 8. McGough KJ. Preserving the Compromise: The Plain Meaning of Waxman-Hatch Market Exclusivity. Food Drug Cosm L. J. 45:487-504. 9. Gorlin, DI. Staving Off Death: A Case Study of the Pharmaceutical Industry’s Strategies to Protect Blockbuster Franchises. Food & Drug L. J. 63:823-864 (2008). 10. Bajefsky RD, Chopskie G. Biting the Hand That Feeds? : Generic Drugs and Abuse of the Hatch-Waxman Law; Washington Legal Foundation 17:1 (2002). 11. Medicare Prescription Drug. Improvement, and Modernization Act of 2003. Pub. L. No. 108-173, 117 Stat. 2066 (2003). 12. Sanofi-Synthelabo v. Apotex, 488 F. Supp. 2d 317 (S.D.N.Y. 2006). 13. Pechersky Y. To Achieve Closure of the Hatch-Waxman Act’s Loopholes, Legislative Action is Unnecessary: Generic Manufacturers Are Able to Hold Their Own. Cardozo Arts & Entertainment Law J. 25:775-803 (2007). 14. Mylan Pharmaceuticals v. FDA, 454 F.3d 270 (4th Cir. 2006). 15. Apotex Comments. Docket 204P-0075/CP1. 16. Schering-Plough v. FTC, 402 F.3d 1056 (11th Cir. 2005). 17. In re Tamoxifen Citrate Antitrust Litigation, 429 F.3d 370 (2d Cir. 2005). 18. H.R. 1706: Protecting Consumer Access to Generic Drugs Act of 2009. 111th Congress, March 25, 2009. 19. Dinh TQ. Potential Pathways for Abbreviated Approval of General Biologics Under Existing Law and Proposed Reforms to the Law. Food & Drug L. J. 62:77-137 (2007). 20. ABN AMRO. February 2008. 21. Anon. 505(b)(2) Approval May Augur FDA’s Biogeneric Policy Arguments. FDA Week (Aug. 26, 2005). 22. Trade Secrets Act. 18 U.S.C. §1905 (2006). 23. Zuhn D. Congressman Waxman Tells GPhA Meeting that Hatch-Waxman Model Will Work for Follow-on Biologics. February 25, 2009. Available at http://www.patentdocs.org. Visited 4/23/09. 24.Integra Lifescience v. Merck K GaA,. Fed. Cir. (June 6, 2003). 25. Medicare Prescription Drug Improvement and Modernization Act. P.L. 108-173 (2003).